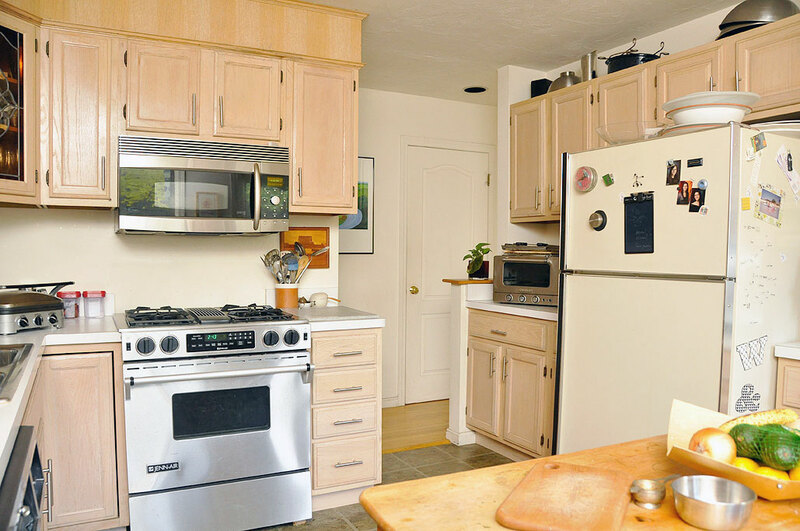 All of the new (to us) appliances in the RainyDayKitchen have a stainless steel finish. 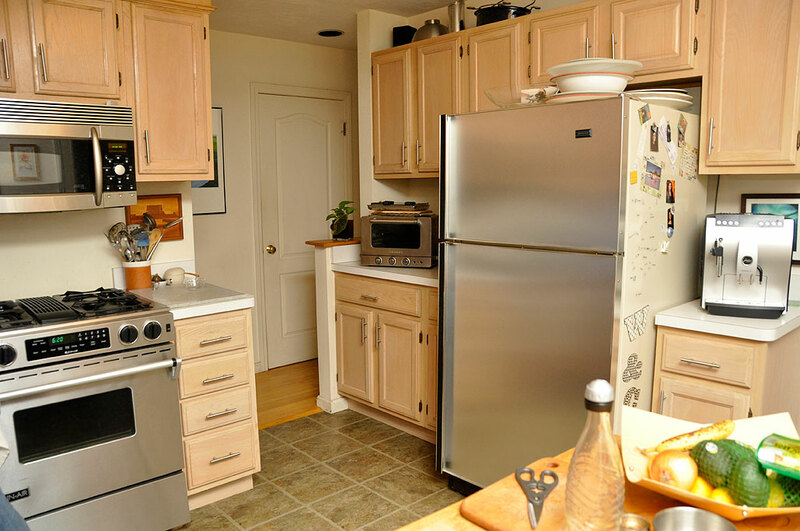 Stainless steel is a great material because it is easy to clean, durable, and requires minimal upkeep. 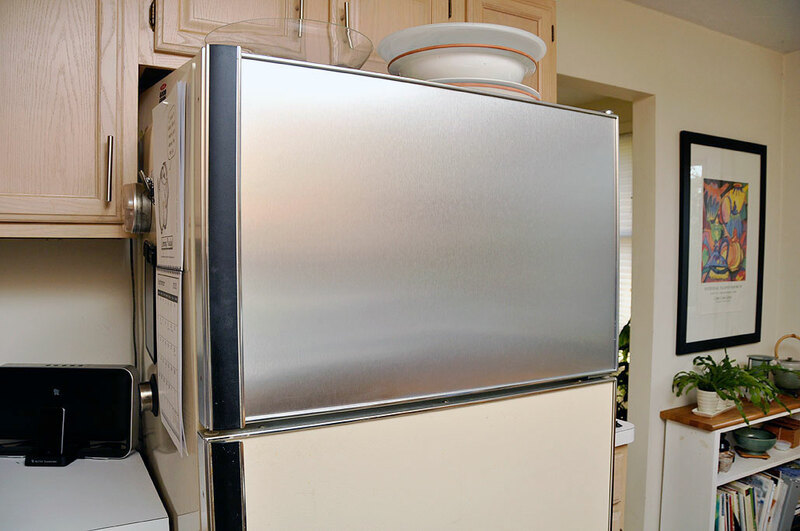 One major appliance which has not been upgraded is the Jenn Air refrigerator. As there is nothing wrong with the refrigerator replacing it solely for cosmetic reasons just seemed ridiculous. The solution we came up with (to solve the dilema of having all stainless steel appliances except the fridge) was to refinish the front panels with stainless steel FXSheeting from Alsa. Yesterday we posted a write-up of the Alsa Stainless Steel FXSheeting. Today we’ll show you how we used the sheets to resurface the refrigerator in the RainyDayKitchen to match our other stainless steel appliances. This is the first time we have ever worked with the FXSheeting material. These stainless steel sheets are not plastic films printed to look like metal. They are real sheets of stainless steel, thin and flexible enough to be easily worked. They are shipped rolled and can be a bit tricky to lay out flat (see yesterday’s article if you are interested in how we worked with the material). The FXSheeting is thicker than wall paper, but thinner than wood veneer. The best part is that the sheets can be cut using scissors or razor blades. They come with an industrial strength adhesive backing which will stick to most surfaces. Just peel and press. We started off with the top panel because we wanted to get a sense of how difficult the material was to cut, position, and apply (and it was smaller). Cutting the sheet was not difficult. We were able to cut it easily with the ZipSnip and by using a single-edge razor blade. A panel the size of the top door front can be worked and applied by a single person. The trim pieces (handle, top, etc…) of the doors were removable. The trim overlap was about 1/4″ so we had a little leeway with how precise we had to be with the measurements. Unlike a foil, excess FXSheeting will NOT fold over the edge; it must be trimmed. We were a little more, generous, with our measurements of the top panel and had to trim all four edges. However, with the bottom panel, we measured precisely and cut the piece with a razor and a straight edge. The panel fit without the need of any additional trimming. The bottom panel was large and took two of us to apply it; one to hold the sheet while the other peeled the backing off. We slotted the panel into the groove at the bottom and worked our way up to the top, peeling and pressing as we went. The best techique was to press from the center out to the edge, as the motion forced the air out from the center, reducing the possibility of trapping it and forming a bubble. It is very important that the surface be COMPLETELY clean (no grease, particles, etc…) before applying the sheet. While the FXSheet is thicker than a foil, any particle underneath the sheet will cause the surface to not stick properly and will show up as a bump. This entire project took us about two hours from start to finish. We took our time because we had never worked with the material before. Now that we have had some experience with the FXSheeting, we could probably do the same project in less than an hour. If you want to update the look of your kitchen appliances, but don’t need/want to actually replace them, resurfacing with FXSheeting can be a very practical solution. If stainless steel is not the look for you, Alsa has a huge collection different kinds of finishes.